City Developments Limited is converting a former commercial building in the Central Business District, One Shenton Way, to a condominium and is expected to release units for sale this year. Carlos Ott, renowned for his designs of Opera de la Bastille in Paris, the Hangzhou Grand Theatre and the National Bank of Dubai, has been engaged as the architect for the project. The 99-year leasehold project, to be released this year, will be developed on the site now occupied by the group’s No 1 Shenton Way office block. Located close to other new developments at Marina Bay such as One Raffles Quay, the Business and Financial Centre, and The Sail @ Marina Bay, the apartment project will have 360 units in two towers, the taller of them proposed at 50 storeys. The units will range from one-bedders to four-bedroom apartments, as well as penthouses with private swimming pools and roof decks. 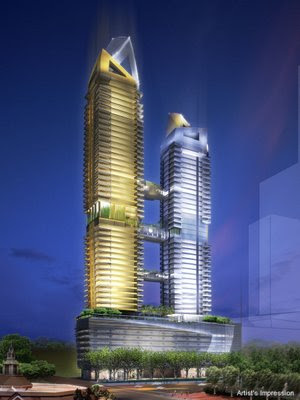 A podium running the length of the development site in Shenton Way will have carparking from the second level onwards. Common facilities for the apartments, like a swimming pool and barbecue pits, will be on the podium’s roof deck. CityDev’s Mr Chia said the design for the yet-to-be-named apartment towers will ‘dramatically redefine the city skyline, which will be another feather in the cap as Singapore aims to become a key architectural centre of the world’. The two towers will be linked at three points. The upper-most link, or bridge, is expected to house penthouses, while the two lower links will house sky terraces and gardens. Although a residential project, the ground floor of the development will be commercial, featuring food & beverage and retail shops to create vibrancy and life at the street level. This will add to URA’s vision to make Marina Bay a vibrant place to live and work. You are currently browsing the Tiong Bahru Estate blog archives for December, 2006.